Whether you head to a nearby orchard for a day of apple pickin’ or purchase fresh locally grown apples at the market, apples simply taste best in the fall! Every time you bite into an apples, you’re biting into a dose of powerful nutrition. A medium apples has fiber, vitamin C and potassium and it is full of health-protective phytochemicals – all for only 95 calories! -Slice apples into your morning hot cereal; add a touch of cinnamon for extra pizzazz. -Pack apples as the perfect between meal snack for work, school or activity – no packaging or refrigeration required. 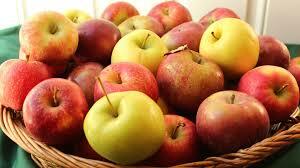 -Slice apples for an appetizer course to serve with dip, such as nut or seed butters, fruit spread or cream cheese.